Last Thanksgiving 2009 my son Jesse suggested we run 1,000 in one year. We set up a chart (click here) and started keeping track. I JUST PASSED THE GOAL A FEW DAYS EARLY! Not only that but I crossed our huge milestone on a bridge crossing the Tiber River in Rome! This was exciting since my first book is entitled CROSSING THE TIBER. 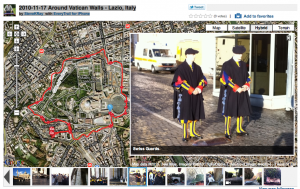 To see the map, the pictures and videos of my 7.2 mile run through Rome, click here. 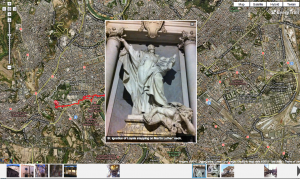 And above my subsequent run the next day (Wednesday) around the Walls of Vatican City. Click the smaller image above or here. And below, our long walk through Rome. Picture shown is a statue in the Church of St. Ignatius Loyola who has his foot on the head of Martin Luther. UPDATE 11-16-10: Wow! 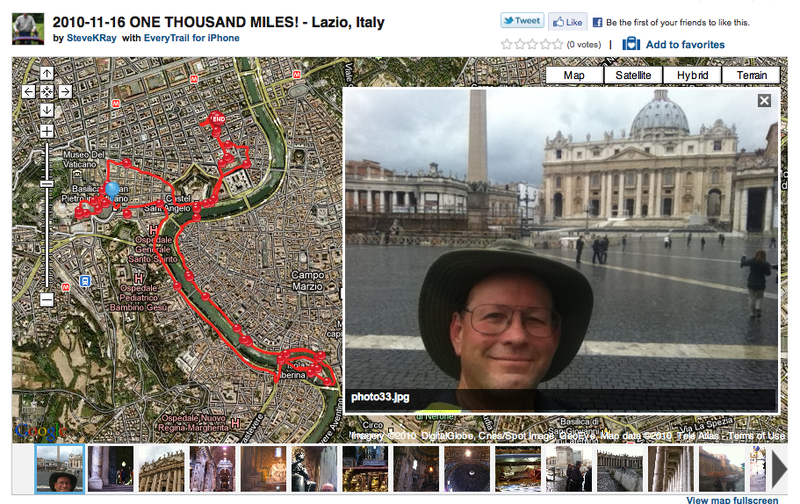 I just passed the 1,000 mile mark in Rome. See the blog with maps, photos, and videos. UPDATE 4-16-10: I just passed the 400 mile mark with an 8.4 mile run through Jerusalem! My son Jesse is right behind me. We are having fun racing against the chart. So I started a new lifestyle with a “homemade program” which really worked (described here). Starting January 1, 2009 I began to “heal myself” with food and exercise. My whole family joined the fun! I lost 30 pounds. Cholesterol dropped to normal healthy levels. Blood pressure and glucose dropped to normal too. Then on November 27, 2010 my son Jesse and I decided to run 1,000 miles in one year — and to ride our bikes 1,000 miles in a year. You can follow our progress with the chart to the right which is updated daily. We are on track with running! But we can’t ride bikes in the winter in Michigan (got catching up to do this summer)! We update this chart daily so you can track our progress. Plus you can check out all the different places I have run around the world with lots of pictures here at EveryTrail.